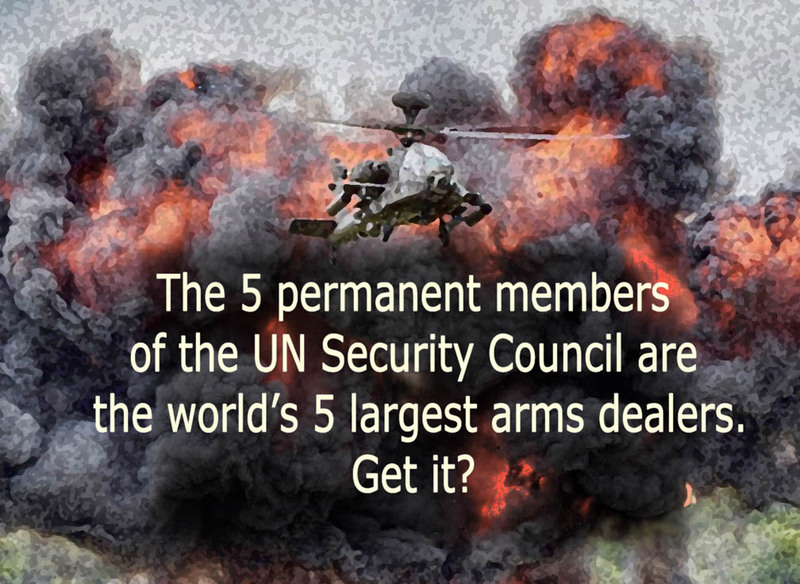 I realised a few months ago that the five permanent members of the UN Security Council were also the five largest arms dealers on the planet. There is no secret about this but few actually recognise the enormity of it. Clearly, the only brain wiring going on there will be to fight for peace with their stock in trade. Perhaps they think that by killing all the “bad guys” on planet Earth they will leave nothing but peace lovers. We can be sure that their arms expenditure will stay high just in case they left a few million “bad guys” out that need to be killed later. Of course, what really happens is that conflicts are created in order to stimulate the arms trade. Now that our interventions in the Middle East have created a situation of permanent conflict these arms dealers are in heaven and cackling all the way to the bank. As the conflict seeps into the fabric of our formerly safe Western society the politicians/arms dealers wring their hands and point their fingers at scary religious terrorists. Their solution, of course, involves more military interventions, more expenditure on security, a lot less freedom for us, and lots more money for them and their ilk. All of this expenditure, less we forget, is funded by us. Meanwhile we are constantly told of the cash shortages that mean state ‘services’ must be cut for lack of funding. The solution to this is always higher taxes and we actually see citizens lobbying for higher taxes to keep this monstrous beast in business. Sigh. I would usually put up an image of my book here, which, as Graham Hancock put it, is “the route map that gets us out of this mess,” but instead here is the stand-alone poster I created to illustrate this point. It went kind of viral on Facebook. Note: The UK recently went to No.2 in the arms dealers list per the latest sources.